How many vegetables people throw away because they are no known, or because nobody has ever shown the way to prepare them? 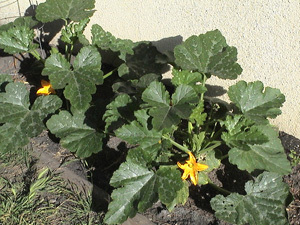 This is the case of the tender fronds at the end the of the squash branches. In Italy we call them ”tenerumi” and they are quite delicious. It is a very simple type food, a peasant food, the stomach doesn’t need complicated food everyday anyway and they can be presented quite elegantly, if you like. 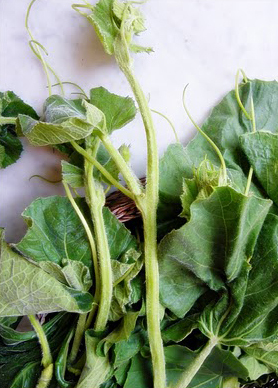 First, when harvesting squashes, separate the large leaves, which are tough to eat from the small tender leaves at the end of the trail. Wash only the tender lease to get rid of soil impurities and cut them in diagonal to make a chiffonade. Bring to a boil a pot pull of salted water. Salt will seal the green color of the leaves and they will not turn grey. Boil the leaves for about 10 minutes, take them out of the water with a perforated ladle, but do not drain the water. In the same water, cook a short type of pasta, such as rigatoni, penne, rotini or ditaloni. Keep it “al dente”. The pasta texture and consistency it is very important for us Italians. In another pan, sauté a couple of shallots or green onions in olive oil, add a couple of chopped tomatoes, or a basket of cherry tomatoes split in half (I like cherry tomatoes better), cook for about 10 minutes, then add the boiled tenerumi leaves to the sauce and let the flavor combine for a few more minutes. If you like a bit of heat, add some chili pepper to the sauce. Tenerumi have a bland flavor, but that is good too, if you like to keep it bland. Adjust the sauce with salt and pepper to your liking, mix cooked pasta in it and serve warm with a generous sprinkle of Parmigiano or Pecorino cheese. This is very simple and healthy version. For a richer taste, it is OK to combine sausage cut in small bites, or pancetta (Italian bacon) while sautéing the onions. Potatoes go well with tenerumi (squash leaves) in place of pasta, or Italian rice Arborio to make a risotto as usual. With or without the starch element, squash leaves are delicious vegetables to pair up with a piece of salmon, or a steak and a nice red wine served in a goblet. Another type of leaves which goes to waste are the carrots leaves. They are delicious in quiches and frittata, or sautéed first and mixed in a meatloaf. Fennel fronds are also not understood leaves, they are good in soups, in roasted lamb with peas and/or combined with eggs. In American markets, I have difficulties finding these kind of leaves, they don’t make it to the shelves of the supermarkets. The solution was to grow them myself, otherwise what it the purpose of having my own garden? Flowers are beautiful, but food grown in my orchard are even better for my health and soul. Valentina Cirasola is an Italian interior designer with a passion for kitchen and cooking. She operates in USA and Europe.